Located in the neighbourhood of Poble Sec, near the port and Montjuïc, this modern three bedroom apartment sleeps up to five people. With plenty of cafés, bars and restaurants nearby, as well as activities to discover at Montjuïc and the scenic port to enjoy, this apartment offers a great location to enjoy some of the city’s best spots. The apartment benefits from plenty from natural light as well as its own private terrace, fitted with outdoor furniture perfect for meals al fresco. The spacious open-plan kitchen, living and dining area features modern fitments and furnishings, with a neutral colour scheme. The kitchen contains everything you need to live comfortably, including a dishwasher, toaster, blender, pots and pans and microwave. The apartment also contains a washing machine, iron and iron board. Relax on the sofa after a home-cooked meal and enjoy the TV and internet. The bedrooms offer plenty of storage and homely touches whilst the modern bathrooms offer large walk-in showers. An elevator provides easy access. 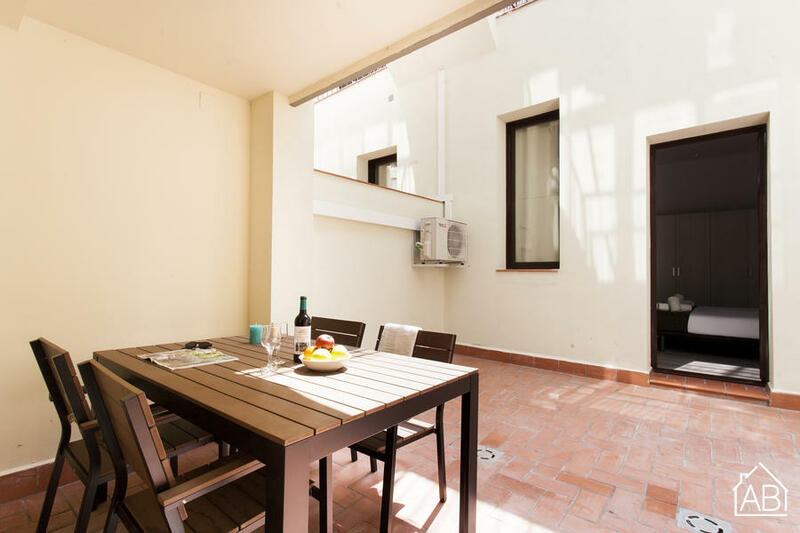 With central heating and air conditioning, as well as the private terrace, this apartment is an ideal option for your stay in Barcelona any time of the year.